The largest collection of fossil human skeletons ever found in a site has given new information about the origin and evolution of Neanderthals, different species of early humans. The collection includes seventeen skulls from the Sima de los Huesos cave (Pit of Bones) in northern Spain. Described in the journal Science, a group of early fossil Neanderthal species from last year's 430 thousand or 100 thousand years earlier than previously reported. 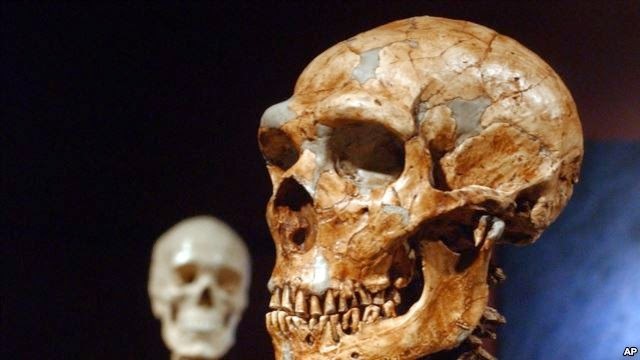 The fossil skull shows a face and teeth of Neanderthal man, but not his skull. The combination of these features usually associated with more primitive hominid species. Examples of fossil skulls support the theory that evolutionary changes arise at different times and not all at once. Research suggests modifications to the face, especially with regard to chewing function, is the first stage in the evolution of Neanderthals. Juan-Luis Arsuago, lead author and a professor of paleontology at the Complutense University of Madrid was surprised to see the similarities of different individuals. "Other fossils from the same geological period was different and did not fit with the pattern found in the caves of Sima," said Arsuago.